A Hieland Pownie, demonstratin the pownie chairacteristics o sturdy bane, thick mane an tail, smaw heid, an smaw oweraw size. A pownie is a smaw horse (Equus ferus caballus). Dependin on context, a pownie mey be a horse that is unner an approximate or exact hicht at the withers or a smaw horse wi a speceefic conformation an temperament. Thare are miny different breeds. Compared tae ither horse, pownies eften exhibit thicker manes, tails an oweraw coat, as weel as proportionally shorter legs, wider baurels, hivier bane, thicker necks, an shorter heids wi braider foreheids. The word pownie derives frae the auld French poulenet, meanin foal, a young, immatur horse, but this is nae the modren meanin; unlik a horse foal, a pownie remeens smaw whan fully grown. Houiver, on occasion, fowk who are unfameeliar wi horse mey confuise an adult pownie wi a foal. The auncestors o maist modren pownies developed smaw statur acause thay leeved on the mairgins o leevable horse habitat. Thir smawer ainimals war domesticatit an bred for various purposes aw ower the Northren Hemisphere. Pownies war historically uised for drivin an fraucht transport, as childer's munts, for recreational ridin, an later as competitors an performers in thair awn richt. In the Industrial Revolution, particularly in Great Breetain, a signeeficant nummer war uised as pit pownies, haulin laids o coal in the mines. Pownies are generally conseedert intelligent an friendly, awtho whiles thay an aw are descrived as stubborn or cunnin. Properly trained pownies are appropriate munts for childer that are learnin tae ride. Lairger pownies can be ridden bi adults, as pownies are uisually strang for their size. In modren uise, mony organisations define a pownie as a matur horse that meisurs less nor 14.2 haunds (58 inches, 147 cm) at the withers, but thare are a nummer o exceptions. Different organisations that uise a strict meisurment model vary frae 14 haunds (56 inches, 142 cm) tae nearly 14.3 haunds (59 inches, 150 cm). Mony breeds clessifee an ainimal as aither horse or pownie based on pedigree an phenoteep, na maiter its hicht. Some full-sized horse mey be cried pownies for various raisons o tradeetion or as a term o endearment. A pownie foal. Pownie foals are smawer than horse foals, but baith hae lang legs an smaw bodies. For mony forms o competition, the offeecial defineetion o a pownie is a horse that meisurs less than 14.2 haunds (58 inches, 147 cm) at the withers. Horse are 14.2 or tawer. The Internaitional Federation for Equestrian Sports defines the offeecial cutaff pynt at 148 centimetres (58.27 in) (juist ower 14.2 h) withoot shaes an 149 centimetres (58.66 in) (juist ower 14.2-1/2 h) wi shaes, tho allous a mairgin for competeetion meisurment o up tae 150 centimetres (59.1 in) (14.3 h) withoot shaes, or 151 centimetres (59.45 in) (juist unner 14.3-1/2 h) wi shaes. Houiver, the term "pownie" can be uised in general (or affectionately) for ony smaw horse, regairdless o its actual size or breed. Fordermair, some horse breeds mey hae individuals that matur unner that hicht but are still cried "horse" an are alloued tae compete as horse. In Australie, horse that meisur frae 14 haunds tae 15 haunds are kent as a "galloway", an pownies in Australie meisure unner 14 haunds. Fowk that are unfameeliar wi horse mey confuise an adult pownie wi a young, immatur horse. While foals that weel grow up tae be horse-sized mey be na tawer than some pownies in thair first months of life, thair body proportions are verra different. A pownie can be ridden an put tae work, while a foal is too young tae be ridden or usied as a wirkin ainimal. Foals, whither thay growe up tae be horse or pownie-sized, can be distinguished frae adult horse bi thair extremely lang legs an slim bodies. Thair heids an een an aw exhibit juvenile chairacteristics. Fordermore, in maist cases, nursin foals weel be in verra close proximity tae a meir that is the mither (dam) o the foal. While pownies exhibit some neoteny wi the wide foreheids an smaw size, thair bouk proportions are seemilar tae that ofan adult horse. Pownies oreeginally developed as a landrace adaptit tae a hersh naitural environment, an war conseedert pairt o the "draft" subteep teepical o Northren Europe. At ane time, it wis heepothesised that thay mey hae descendit frae a wild "draucht" subspecies o Equus ferus. Studies o mitochondrial DNA (that is passed on tho the female line) indicate that a lairge number o wild meirs hae contreibutit tae modren domestic breeds; in contrast, studies o y-DNA (passed doin the male line) suggest that thare wis possibly juist ane single male auncestor o aw domesticated breeds. Domestication o the horse probably first occurred in the Eurasie steppes wi horse o atween 13 haunds (52 inches, 132 cm) tae ower 14 haunds (56 inches, 142 cm), an as horse domestication spreid, the male descendants o the oreeginal stallion went on tae be bred wi local wild meirs. Domesticated pownies o aw breeds oreeginally developed mainly frae the need for a wirkin ainimal that coud fulfill speceefic local draucht an transportation needs while survivin in hairsh environments. The uisefuness o the pownie wis notit bi fermers that observed that a pownie coud ootperform a draucht horse on smaw ferms. Bi the 20t century, mony pownie breeds haed Arabie an ither bluid addit tae make a mair refined pownie suitable for ridin. Pownies are seen in many different equestrian pursuits. 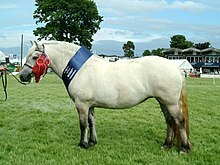 Some breeds, such as the Hackney pownie, are primarily uised for drivin, while ither breeds, sic as the Connemara pownie and Australie Pownie, are used primarily for riding. Others, such as the Welsh pownie, are used for both ridin an drivin. Thare is na direct correlation atween a horse's size an its inherent athletic abeelity. Pownies compete at events that include shaw hunter, Inglis ridin on the flat, drivin, an wastren ridin clesses at horse shaws, as weel as ither competitive events such as gymkhana an combined drivin. They are seen in casual pursuits such as trail ridin, but a few pownies hae performed in internaitional-level competeetion. Tho mony exhibitors confine themsels tae clesses juist for pownies, some tap pownies are competitive against full-sized horse. For example, a 14.1 haund pownie named Stroller wis a member o the Breetish Equestrian shaw jimpin team, an wan the siller medal at the 1968 Simmer Olympics. Mair recently, the 14.1-3/4 haund pownie Theodore O'Connor wan the gowd medal in eventin at the 2007 Pan American Gemmes. Pony Clubs, appen tae young fowk that awn aither horse or pownies, are formed warldwide tae eddicate young fowk aboot horse, promote responsible horse awnership, an an aw sponsor competitive events for young fowk an smawer horse. In mony pairts o the warld pownies are an aw still uised as wirkin ainimals, as pack ainimals an for pullin various horse-drawn vehicles. Thay are uised for childer's pownie rides at traivelin carnivals an at childer's preevat paorties whaur smaw childer can tak short rides on pownies that are saidled an then aither led individually or hitched tae a "pownie wheel" (a non-motorised device akin tae a het walker) that leads sax tae aicht pownies at a time. Pownies are whiles seen at simmer camps for childer, an are widely uised for pownie trekkin an ither forms o Equitourism ridin halidays, eften cairyin adults as weel as childer. The Shetland pownie is ane o the smawest pownie breeds, but is verra strang. Pownies are eften distinguished bi thair phenoteep, a stocky bouk, dense bane, roond shape an weel-sprung ribs. Thay have a short heid, lairge een an smaw ears. In addeetion tae bein smawer nor a horse, thair legs are proportionately shorter. Thay hae strang huifs an growe a hivier hair coat, seen in a thicker mane an tail as weel as a pairteecularly hivy winter coat. Pownie breeds hae developit aw ower the warld, pairteecularly in cauld an hersh climates where hardy, sturdy working animals were needed. They are remerkably strang for their size. Breeds sic as the Connemara pownie, are recognised for their ability to carry a full-sized adult rider. Poond for poond pownies can pull an cairy mair wecht nor a horse. Draucht-teep pownies are able tae pull laids signeeficantly greater nor thair awn weight, wi lairger pownies capable o pullin laids comparable tae thae pulled bi full-sized draucht horse, an even verra smaw pownies able tae pull as muckle as 450 percent o thair awn wcht. Nearly aw pownie breeds are verra haurdy, easy keepers that share the abeelity tae thrive on a mair leemitit diet than that o a regular-sized horse, requirin hauf the hey for their wecht as a horse, an eften nae needin grain at aw. Houiver, for the same raison, thay are an aw mair vulnerable to laminitis an Cushing's syndrome. Thay mey an aw hae problems wi hyperlipemia. Pownies are generally conseedert intelligent an friendly, tho whiles thay an aw are descrived as stubborn or cunnin. The differences o opeenion eften result frae an individual pownie's degree o proper trainin. Pownies trained bi inexperienced individuals, or anerly ridden bi beginners, can turn oot tae be spoiled acause thair riders teepically lack the experience base tae correct bad habits. Properly trained pownies are appropriate munts for childer that are learnin tae ride. Lairger pownies can be ridden bi adults, as pownies are uisually strang for thair size. The Connemara pownie is a lairger pownie that occasionally maturs ower 14.2 haunds. For shawin purposes, pownies are eften grouped intae smaw, medium, an lairge sizes. Smaw pownies are 12.2 haunds (50 inches (130 cm)) an unner, medium pownies are ower 12.2 but na tawer than 13.2 haunds (54 inches (140 cm)), an lairge pownies are ower 13.2 haunds but na tawer nor 14.2 haunds. The smawest equines are cried miniatur horse bi many o thair breeders an breed organisations, raither nor pownies, even tho thay staund smawer than smaw pownies, uisually na tawer nor 38 inches (97 cm) at the withers. Houiver, thare are an aw miniature pownie breeds. ↑ n.a. (2005). Oxford American Dictionaries (computer application). Apple Computer. ↑ "PONY MEASUREMENT 2007 30 January 2007 " Explanation of Article 3103.1, FInternational Federation for Equestrian Sport Wab steid, Accessed October 7, 2009 Archived 26 Julie 2011[Date mismatch] at the Wayback Machine. ↑ Bennett, Deb (1998). Conquerors: The Roots of New World Horsemanship (First ed.). Solvang, CA: Amigo Publications, Inc. p. 7. ISBN 0-9658533-0-6. OCLC 39709067. ↑ Jansen, Thomas; Forster, Peter; Levine, Marsha A.; Oelke, Hardy; Hurles, Matthew; Renfrew, Colin; Weber, Jürgen; Olek, Klaus (6 August 2002). "Mitochondrial DNA and the origins of the domestic horse". PNAS. 99 (16): 10905–10910. doi:10.1073/pnas.152330099. PMC 125071  . PMID 12130666 – via www.pnas.org. ↑ 9.0 9.1 Lindgren et al. Nature Genetics, Volume 36, Number 4, April 2004, p 335 Archived 2011-07-19 at the Wayback Machine. ↑ 10.0 10.1 Anthony, David W. (2007). The Horse, the Wheel, and Language: How Bronze-Age Riders from the Eurasian Steppes Shaped the Modern World. Princeton, NJ: Princeton University Press. pp. 196–197, 202. ISBN 978-0-691-05887-0. ↑ Sponenberg, D. Phillip (1996). "The Proliferation of Horse Breeds". Horses Through Time (First ed.). Boulder, CO: Roberts Rinehart Publishers. pp. 155, 170–173. ISBN 1-57098-060-8. OCLC 36179575. ↑ 14.0 14.1 14.2 14.3 14.4 14.5 "Pony Power!". This ainimal-relatit airticle is a stub. Ye can help Wikipaedia bi expandin it. This page wis last eeditit on 24 October 2018, at 01:52.